Did you know that going meatless for a few meals a week can save you a considerable amount of money? While we typically go meatless on Fridays for Lent, we’ve decided to try it a couple more days each week to cut out some of those meat expenses. 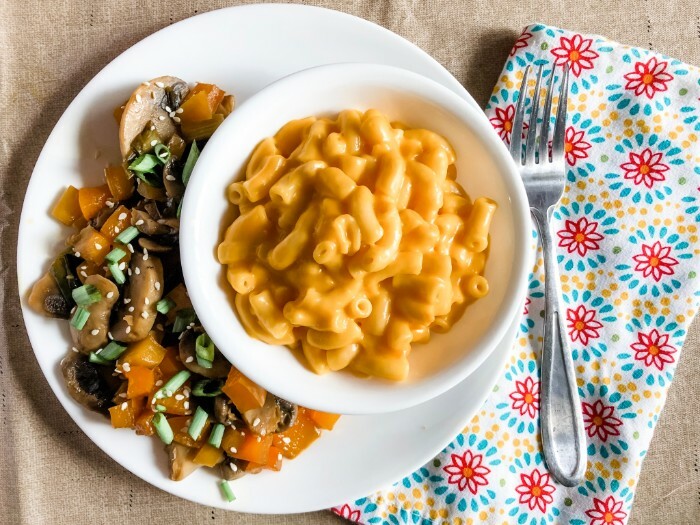 And one of our favorite things to pair with other meatless foods is… you guessed it… macaroni and cheese! 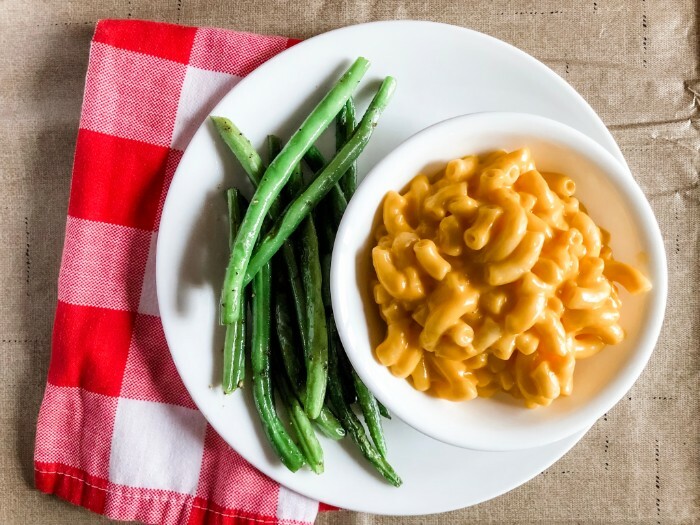 STOUFFER’S® Macaroni & Cheese has made our meatless meals even simpler. It’s hot and ready in minutes, so it’s always easy to pull a meatless meal together. 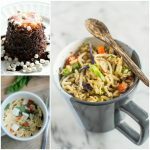 Here’s a list of 13 foods to pair with mac and cheese to make a complete meatless meal. 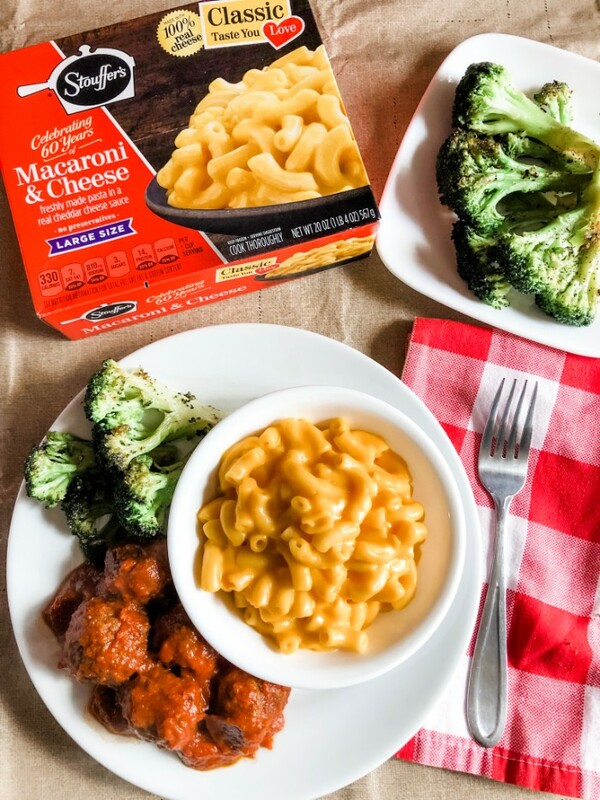 Hover over the photo to click and purchase Stouffer’s mac and cheese for yourself. You’ll love the creamy cheesy goodness of this dish! In our house, mac and cheese can be either the star of the show or a side dish. It just depends on what we’re in the mood for. So here are some of the ways we pair mac and cheese with other dishes to round out our meals. If you’re looking for something simple, these garlic sauteed green beans are it! Simply trim the ends off your fresh green beans and blanch them in boiling water for one minute. Then, add them to a pan with two tablespoons of olive oil, about 1/4 teaspoon of garlic powder and salt and pepper to taste, and you have a delicious side for your mac and cheese main dish! For a hearty meal, pair your mac & cheese with vegan or vegetarian chili. The creaminess of the mac and cheese offsets the heat of the chili wonderfully. You can use our recipe for Black Bean and Corn Chili if you need a yummy no-fail recipe! Roast some veggies in the oven! Use whatever you have on hand… carrots, bell peppers, mushrooms, sweet potatoes… etc. 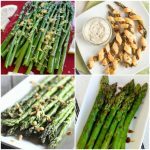 Simply drizzle the veggies with olive oil, season with your favorite herbs and spices, and bake until the veggies are tender. 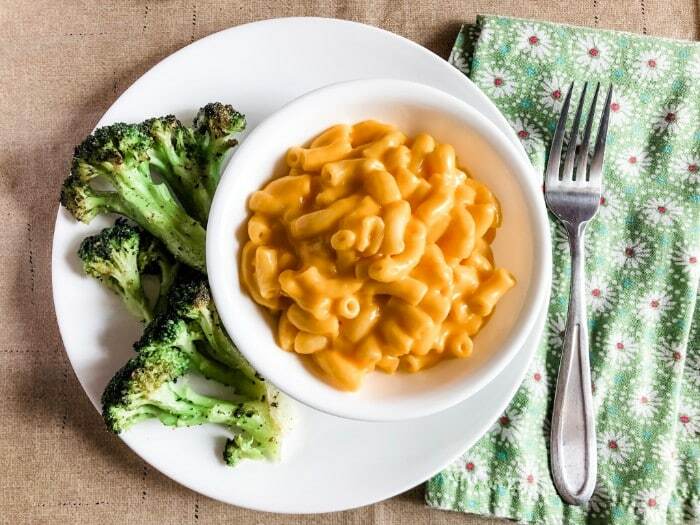 It’s easy to get kids to eat more veggies when they’re paired with mac and cheese! This simple stir-fry is one of our favorites. Add two tablespoons of cooking oil and 1 tablespoon sesame oil to a pan. Add diced green onions, bell peppers and mushrooms to the pan. Cook for two minutes, add a tablespoon of rice vinegar and 2-3 tablespoons of soy sauce, and you’re all set. You can top with sesame seeds if you like. Both the veggie stir fry and the macaroni and cheese are the perfect sides for your Friday fish if you’re observing Lent. Both would be great with salmon! Bring home creamy cheesy goodness with your Friday fish with STOUFFER’S Macaroni & Cheese, available in-store at Walmart. My kiddo loves veggie pinwheels, and there’s no cooking involved in making them, so all you have to do is heat up your STOUFFER’S Macaroni & Cheese in the microwave, and dinner’s ready! To make veggie pinwheels, simply spread a flour tortilla with cream cheese and top that layer with finely diced veggies like carrots, onions, bell peppers and olives. You should also toss a little shredded cheddar in there. Roll them up, slice them into pinwheels, and you’ll have happy kiddos on your hands. If you want a little something sweet to go with dinner but you don’t want a heavy dessert, a fruit salad pairs perfectly with mac and cheese as your main. 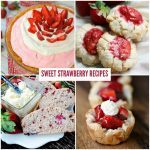 We have a yummy fruit salad recipe here, but use whatever you like! 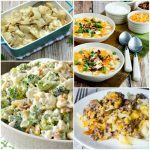 I didn’t realize that broccoli paired with mac and cheese was such a staple in so many homes, but it is! Our favorite recipe for broccoli is easy as can be. Pre-heat the oven to 400 degrees. Drizzle frozen broccoli with olive oil, and season with salt, pepper, and a little garlic powder. Bake 20 minutes, and then turn over and bake for an additional 10 minutes. Done! So good! Tomato and Onion Salad is a simple dish to go with creamy mac and cheese, too. Cut up your onions and tomatoes into slices, and toss them with olive oil, fresh cracked black pepper, garlic salt, and a little basil. Salad is a no-fail side that pairs well with mac and cheese. Caesar salads are great, and the flavors go well together. 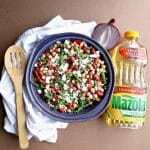 But don’t be afraid to experiment with other salads, such as bean salads or a mix of greens and berries. Our kid likes to have some sort of meat with most meals, so serving vegetarian “meatballs” with rich, melty macaroni has saved us with our picky eater. You can find the meatless meatballs in the freezer section. Just heat them along with your favorite sauce, and serve with STOUFFER’S Macaroni & Cheese and a green veggie. What an easy dinner! Speaking of vegetarian meats, hot dogs are a popular choice in our house, too. Our son loves hot dogs cut up and served with his mac and cheese, and the meatless versions taste yummy but still fit in with our Lenten Fridays. Those frozen bags of veggies and lentils with sauce are also an easy addition to a meatless meal. 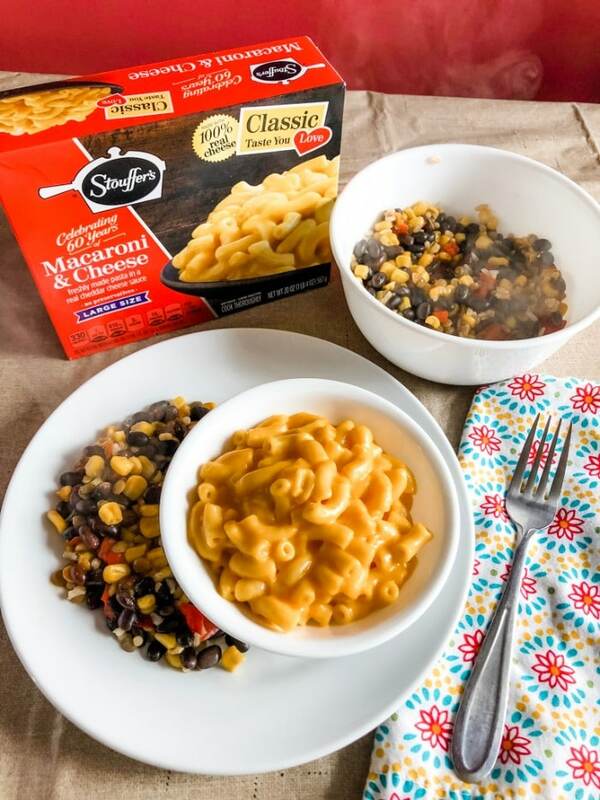 If you can find a southwest blend with black beans, corn, and spices, that’s a yummy addition to your mac and cheese. Who doesn’t love pizza? It’s our second favorite comfort food… next to mac and cheese! You can top yours with lots of veggies and either add a little cheese or skip it altogether since you have lots of delicious cheese flavor in the mac. What are you waiting for? Bring Home Creamy Cheesy Goodness today to complete your meatless meals! 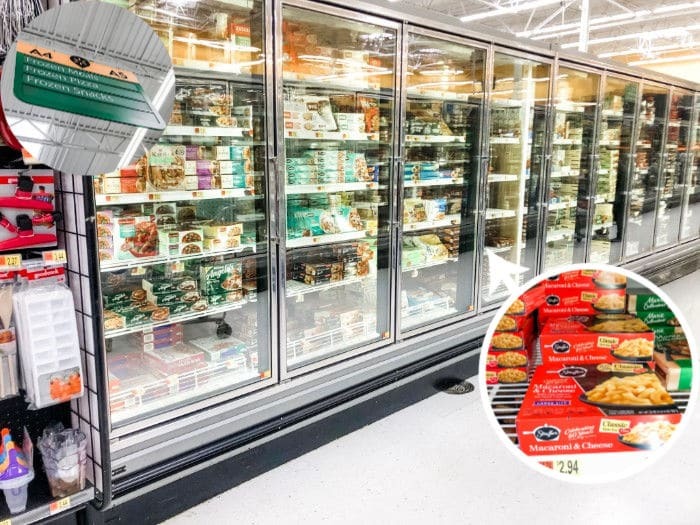 You can find STOUFFER’S Macaroni & Cheese in store at your local Walmart in the freezer section along with other frozen meals. Reference the pic below if you need help finding it. The STOUFFER’S® Large Size Macaroni & Cheese entrée, 20 oz. is the perfect size for our family of three, but if you have a larger family, go for the 40 oz. Family Size option. What’s your family’s favorite meatless meal? Share it with us in the comments! I love all of your ideas! The veggie stir fry looks yummy. Thanks for all the clever suggestions!